40 interviews were undertaken with local residents on door steps, in houses, gardens and over phone and email. Insights from these interviews were then used to hold a community workshop to elaborate on concerns, which 43 residents attended. This research engaged with 67 local residents. Below is a summary and further research into those concerns. Take a few minutes to read through this and feel free to comment at the bottom. It is highly likely that if any new housing development happens, it will introduce more regular pollutant vehicles to the local area. The major sources of pollution in the Borough of Barnet are petrol cars, diesel cars and emissions coming from mobile machinery used on construction sites, such as excavators and dumpers. Residents surrounding Whalebones Park are highly likely to own cars, and use them regularly. 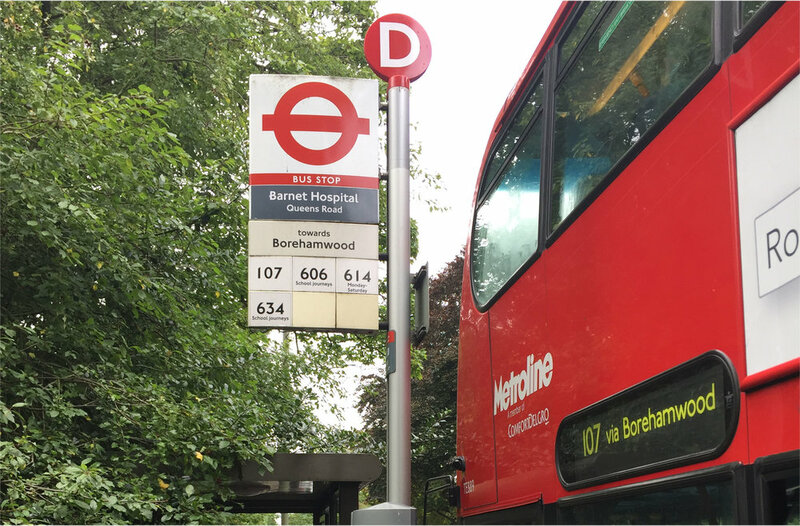 This use is compounded by there only being one regular bus service that goes from High Barnet, High Street and Underground station to Whalebones Park on Wood Street. Development on Whalebones Park will dramatically impact Barnet councils' air quality action plan. NO2 and PM10 would increase beyond a safe limit with a devleopment on Whalebones Park. 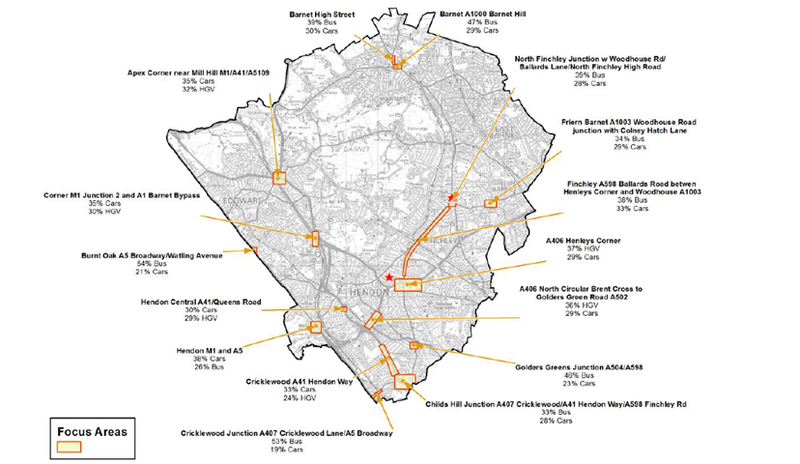 Barnet Council stipulate that there should be no more than 40 NO2 (µg/m3). As you can see from the map below, Barnet Hill was practically double that limit in 2013, with Wood Street just below it at some points. Barnet council also stipulate that there should be more more than 40 PM10 (µg/m3). (PM10 stands for particulate matter of 10 micrometers. Basically microscopic stuff in the air). As you can see from the map below, Barnet Hill was just below the limit. Both of these maps were created in 2013 before the new Elmbank development on Wood Street, which comprises of 33 new homes ranging from two bedrooms to five bedrooms. Air quality on the focus areas is already highly likely to have got more polluted since 2013. It is also highly likely that the Elmbank development has further reduced air quality in the area surrounding Barnet hospital. Many people move to High Barnet because they want to live in a leafy suburb of London, with access to the city, but also being able to experience the peace and tranquility of the countryside. Barnet hospital patients who access the hospital past Whalebones Park. Especially the maternity ward, which overlooks Whalebones Park. Barnet council is well aware of this ethos and the impact that green space has on people's lives. It is even part of their corporate plan for ‘Barnet’s parks and green spaces will be amongst the best in London’. It is well known that Barnet's population is set to increase significantly in the years to come, especially with the number of over 65’s. This will inevitably bring in new denser housing. However, green spaces are the fabric of Barnet’s society. Barnet council also accept that urban parks deliver a huge range of benefits. It is worthwhile remembering that removing green space can lead to a change in the character and understanding of an area. As well as enhancing an area, Green Space can add benfits to the economy, society and environment. Whalebones Park is situated on Wood Street and Wellhouse lane, which is next to Barnet Hospital. This means that it is a main route for accident and emergency services. Wood Street is also the main road connecting High Barnet to the A1 dual carriageway, which provides access to a large variety of other areas in the borough, including Edgware. This route is critical for emergency vehicles including ambulances and police cars. It was known in 2014 that Wood Street had a large number of road accidents. This led a new roundabout and zebra crossing being built in the spring of 2017. It is not yet known what the impact of this change has been, but it did take four years to complete, which did increase congestion. Also due to parking challenges at Barnet hospital, Wood Street is filled everyday with parked cars, many of which belong to hospital staff. Wood Street is a main road connecting different parts of the borough together. There is unrestricted parking on it as well as roads leading off of it. This creates congestion and adds to pollution. This also has a knock on effect of hindering emergency services such as ambulances. Housing developer, Hill, has not submitted any development plans yet. But when they do, you will be able to find them on Barnet council's planning portal. Relevant search terms on the portal should be Wood Street and Whalebones Park. If you would like to comment to the local authority about the plans when they go through, you will need to do it in writing either online, though postal services or in person. To find out more, click here to view Barnet council's guide to commenting on planning. What are your thoughts about a new development on Whalebones Park? Please do share your thoughts in the comment box below. This will be used by the campaign group to better understand what people think about development on Whalebones Park.